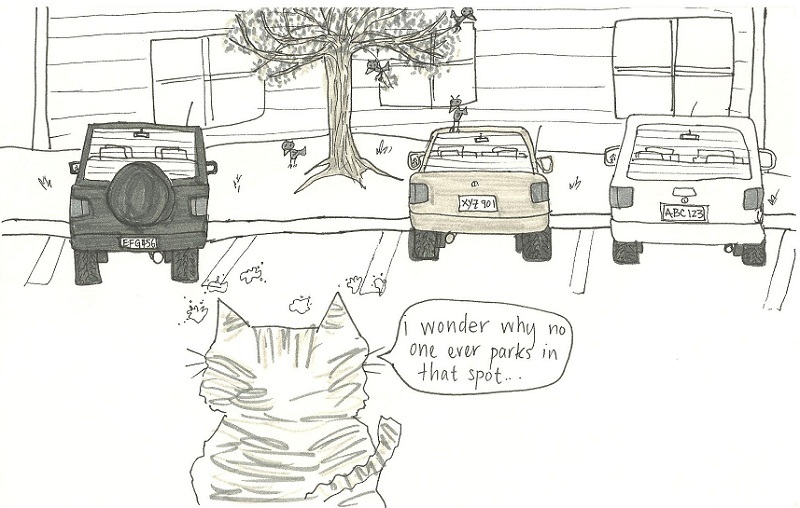 You should think very carefully about where you park next. These are the real angry birds. What’s one of the top iPhone downloaded apps? That’s right. Angry Birds. Now, I don’t have an iPhone (just a sweet Blackberry Curve from 2.5 years ago – still in near mint condition thanks to that lame leather case it came with. Don’t worry, I didn’t wear it in a belt clip.) but I am familiar with the delightful antics of those birds and using my knowledge of physics to successfully smash things. However, I think they got it all wrong. Instead of throwing birds you should be throwing bird dirt (as said in Top Gear and I love it, ha!). Seriously – birds can go potty wherever they want in this wonderful wide world and it generally ends up someplace obvious and expected. Let’s be a little more creative, please. So there’s this parking spot near our apartment that is THE last one filled, guaranteed. There’s even a scooter driver here and even he/she doesn’t park there. I’ve thought about this and talked with Adam and we felt befuddled, mildly amused, and perhaps like we were on the outside of some inside scoop or something. Really, what the heck is going on? Is there some sort of forcefield repelling cars? Perhaps that’s a special reserved spot for a VIP (Smudge…is that really necessary – you were too afraid to take your driver’s test and only have Heelys). I guess it could be because it’s right in the middle between the two walkways and the exhaustion from the extra 20 – 30 feet could result in fatigue related accidents as folks surmount the stairs, so safety could be a priority with the neighbors. Eventually I decided to test fate and potentially the wellbeing of my car or even myself and I parked there. And I learned why no one wants to park in that spot. You see, as depicted above, there is a happy little tree directly in front of the spot. Trees tend to lure birds. Birds tend to poop. Right on my car. I’m pretty sure there was some on my door handle. The lesson I learned is that I should heed the clues left by my neighbors, thus avoiding the need for a car washing. Who am I kidding? We all know I’d probably just let it sit until the rain washed it off anyway. Flashback drawing: This could be a movie. After I chose to post this drawing, all I can hear are the Go-Go’s in my head. Thanks, me. Love the cattoons. I like cats but will never be responsible enough to have one. Cartoons of them are the best way I can enjoy them. If you haven’t seen these yet you need to immediately. Eh, cats pretty much take care of themselves. You’d be fine. But thanks for the link – I’ve seen those before and they’re pretty hilarious! I feel your pain! I parked in Maxine’s driveway last year, on the day the robins were flying over on their way back up North. We laughed at the hundred of crazy birds, until I went to leave and found my car COVERED with “bird dirt”. And not just dirt, but seeds from some plant that fermented and made the damn birds drunk! Oy! This just cements my already firm belief that birds are evil. Yep, you heard right…EVIL!